Just as the San Diego City Council approves even more restrictions on medical marijuana collectives, two seemingly unrelated agencies hold the certification decision in their hands before these restrictions become law. The new ordinance, created by the city, will regulate the placement of medical marijuana storefronts. The ordinance must now be considered and approved by the California Coastal Commission and the San Diego County Regional Airport Authority, according to SignOn San Diego. This little detail’s not sitting well with collectives, patients and cannabis advocates. The Los Angeles medical marijuana attorneys at the CANNABIS LAW GROUP have filed lawsuits against the city on behalf of numerous marijuana dispensaries throughout the Los Angeles area. The fight is far from over. The city’s laws on cannabis dispensaries is inherently unfair — arbitrarily favoring some businesses while forcing other businesses to close. We are seeking economic and punitive damages against the city and are fighting for the rights of dispensaries to remain open. The new ordinance says that if the airport authority finds the new restrictions to be consistent with land-use comparability plan affecting airport facilities. then the ordinance would then take effect one month later. It may not become a law in all areas, however. Coastal areas would not be required to abide by the law until the state commission unconditionally certifies a local coastal program amendment. Many anticipate the weighing of the restrictions by the agencies. The rules don’t specify how long the airport authority has to make their findings, but state law determines a conclusion must be offered in 60 days, according to Gina Coburn, spokeswoman for the City Attorney’s Office. Some collective operators have tried to start the permitting process. Unfortunately, they’ve been denied because the mayor has yet to submit a plan specifying who will oversee permitting, compliance and enforcement. Some have even offered to put up deposits or requested property inspections. The fogginess of this ordinance has left most of the collective operators in a wait-and-see posture. 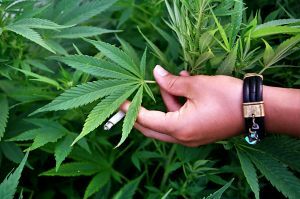 Under the new ordinances, the more than 160 of the city’s medical marijuana collectives will have to shutter their storefronts and apply for operating permits once the new law takes effect. Dispensaries would be limited to some industrial zones and commercial areas and would be required to remain at least 600 feet from one another. They will also need to remain at least 600 feet from libraries, schools, parks, child care and youth facilities, playgrounds and churches. Under the new ordinance, the dispensaries would have to operate as nonprofits, have curtailed business hours and hire security guards. Owners are currently pushing for a referendum by Citizens for Patient Rights, which may further complicate the already uncertain time line. A referendum means these companies and owners have till the end of May to college more than 31,000 signatures from registered voters. If the signatures are collected, the council would either overturn the ordinances or put them on a ballot.